It has become known as the Stone Creek Valley War, and for a time the land ran red with the blood of the innocents and killers alike. In the middle of it all stands a young man, Chad Hunter, against the murderous bunch called the Committee, trying to halt their takeover of his once peaceful home. The Committee are the four biggest ranchers in the area, and to help them achieve what they want, they hire Slade Johnson and his cohorts to deal with those who refuse to bow to their demands. Then there’s ‘Killer Creel’, a cold-blooded murderer who has escaped from prison, and whose ultimate goal is to reap revenge upon Hunter. The Committee had lynched his brother and shot his father down, so Hunter loads his guns and prepares to deal out his own brand of justice. With killers to his front and one closing in from behind, it may just be a war that Hunter can’t win. From the opening chapter that sees Chad Hunter framed for cattle rustling this book held my attention as I had to see how, if at all, Hunter could succeed in his quest to destroy the Committee. B.S. Dunn has created a great set of characters that will face-off with each other a number of times before the reason the Committee want to take control of the valley is revealed. This then leads to some desperate bluffs to bring them down. ‘Killer Creel’ makes for a terrific additional problem for Hunter and their showdown is as gripping as you’d hope it would be. But it’s the final confrontation between Hunter, the Committee and their hired killers that brings forth a shocking surprise that I certainly didn’t see coming that will make the ending stick in my mind for some time to come. This is the first Black Horse Western by B.S. 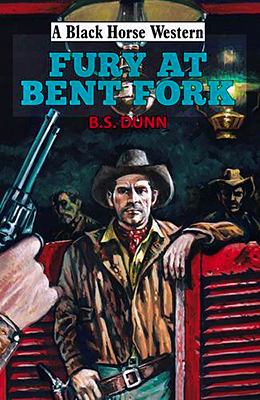 Dunn, a pseudonym used by Brent Towns, and what a superb introduction to his writing it is. I’ll certainly be looking out for his next book. While passing through Cherrywood Crossing, US Marshal Maxfield Knight is confronted by a gang of hired guns who tell him to ride the other way, or be shot down. With no choice but to ride into the high country, Knight soon learns he is being hunted by a man named Silas Manchester, but why, he has no idea. Determined to survive this dangerous game that he’s been forced to play, Knight is destined to become the hunter rather than the hunted. Aided by a mountain man named Lacroix, Knight decides to bring the fight to Manchester and get answers. Meanwhile, Knight’s partner, Deputy US Marshal Cole Tibbs, sets out looking for his missing friend. Tibbs will discover that he, like his friend, has also become part of a dangerous game that turns into a serenade of violence. Thomas McNulty returns to a couple of characters from previous books, namely Knight and Tibbs – another couple of his early book leads get a mention too – making this a must read for anyone who has been following McNulty’s publications. This tale doesn’t have a very complicated plot, the mystery of why Knight is being hunted comes to light fairly early on, which enables McNulty to have great fun with the fight for survival. Knight and his two companions against fifty guns! Nearly all of this book deals with that confrontation making the story read like one long gunfight and that is fine by this reader. McNulty really does know how to write exciting action sequences and even manages to inject a little humour into this deadly situation. When Knight decides to take the fight directly to Manchester by killing all those that stand in his way the book becomes impossible to put down. If you’re looking for a western that really is action-packed then grab a copy of this as soon as possible. “You need more than a shotgun to ride the Chisholm Trail…” So said a grizzled, foul-smelling buffalo hunter in Newton, Kansas. But Wade Aubrey thought the man was just trying to scare him into buying a big Springfield rifle, and Wade had seen his fill of rifles in the war. 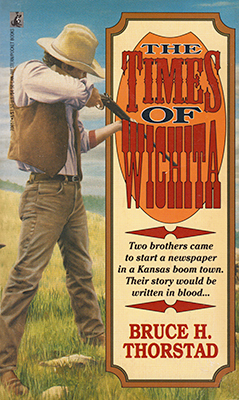 He and his younger brother were going to Wichita to start a newspaper – and get ink on their hands, not blood. 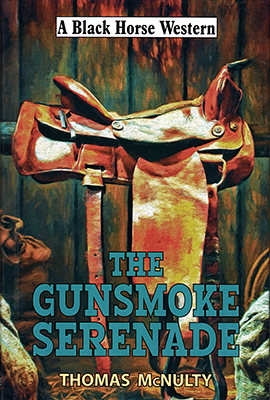 Filled with excellent characters this gripping tale offers gunplay, political skulduggery, love and a touch of mystery. Wade Aubrey’s attempts to change things through the use of words, both spoken and written, seem doomed to failure almost from the start. Will he be able to resist resorting to the way of the gun? Bruce H. Thorstad writes extremely well, his attention to detail adding many memorable observations to this story. He also effortlessly combines information about printing newspapers and buffalo hunting so smoothly they seem like a natural part of the story rather than a ‘how-to’ manual. Everything builds towards a tense and emotion driven final showdown that will have the reader guessing as to the outcome. This is the first book I’ve read by Bruce H. Thorstad and it certainly won’t be the last. He is the most cruelly dangerous opponent the Derby Man has ever challenged, Wesley Bryant, now crime lord of San Francisco. 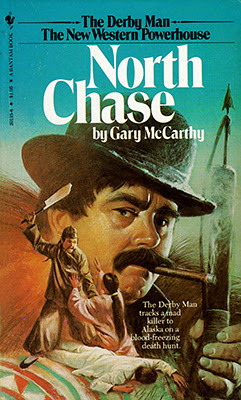 Darby smashes through the sword-wielding Chinese Tong warriors who protect Bryant’s vicious web of vice but Bryant escapes to launch his most ruthless scheme – stealing the vast wealth of Alaska for his own empire of evil. The Derby Man hurls himself into a desperate chase through deadly traps and across Alaska’s brutal tundra until he stands alone in the icy savagery of a wilderness blizzard in his ultimate showdown with a deadly madman. Following on closely from the previous book in the series, Explosion at Donner Pass, Darby is horrified to discover Bryant is still alive, and this isn’t the only shock for the Derby Man for he is to meet Connor O’Grady, a young man of ambition who will bring his own set of problems for Darby, but to say any more about that will spoil the surprise of just who O’Grady is. As before the book presents the reader with a mix of real events and people perfectly combined with fiction. The fast pace of the story never slows down as the tale becomes a frantic race against time that sees Darby pursuing his quarry by ship and dog-sledge. Even among all the violence Gary McCarthy still manages to insert moments of humour and you’ll find yourself wondering if The Derby Man and Dolly Beavers will ever find time for themselves or if they even have a future together? The Derby Man books are certainly worth taking the time to search out in those used book stores as they are now long out of print as paperbacks but if you don’t mind reading ebooks then they are now available in this form and can also be found as audio books. Whatever your preferred method then this series is one that should appeal to all fans of the western genre. Deed Corrigan earned a reputation as a gunfighter – the hard way. But now, after forging cattle trails and fighting off the Comanche, he’s setting his sights on a brighter future. With the help of his older brother Blue, a Civil War veteran who lost his arm in battle, Deed turns the homestead into a successful, working cattle ranch. 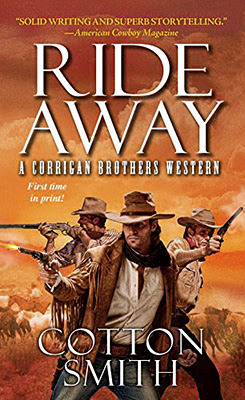 With many publishers ceasing their western lines it’s great to see Pinnacle still publishing new paperback westerns such as this, the first in a brand new series by Cotton Smith. Although a few of Mr. Smith’s books can be found in my collection I believe this is the first one I have read. The books starts with a lengthy and exciting stagecoach attack by Comanche warriors that spills over into another desperate fight at the waystation. These two confrontations introduce the reader to a number of the main characters, one, who just might find himself on the opposite side to his new friend Deed Corrigan as events unfold. Deed will also find a reason to stay away from his ranch but is it one he’s ready for? Cotton Smith weaves his tale together superbly, presenting the reader with a gripping story that offers plenty of action, a couple of surprising twists, and characters you can believe in. Of course being the first in a series there are a couple of storylines that finish in such a way they can be further developed in coming novels, books that I for one am looking forward to reading, it’s just a shame that I’ve got to wait until October to read the next Corrigan Brothers story; Kill Town. It is the time of the annual Sun Dance, but this year the celebration is marred by sadness. On the trail south, the holy man Singing Wolf makes a terrible discovery: an entire village destroyed by the dreaded poch, the spotted death. There is only one survivor, a young girl called Gray Mouse. For the good of the tribe, Singing Wolf knows they must leave the girl behind. Yet the aged and grieving Running Deer will stay behind to care for Gray Mouse. Seeking to join her departed husband and daughter, Running Deer will instead discover a new reason to live as she nurses Gray Mouse to health. 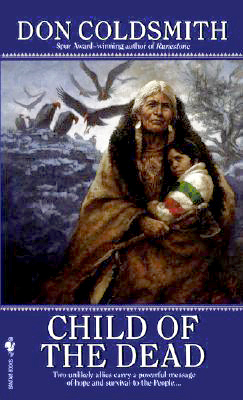 Together the old woman and the young girl will begin an extraordinary quest to re-join the People, bearing a powerful vision of courage, hope, and survival. There is much to admire in Don Coldsmith’s writing of this book. His observations of heart-break, despair, the uselessness of old-age, the humour in not giving a damn how the younger generation see the antics of the elderly, the human spirit to survive, and the power of hope, to name but a few of the feelings that Coldsmith brings to life in such a way you’ll find yourself sharing these emotions with his beautifully crafted characters. Singing Wolf must also wrestle with the question of how to fight a killer you cannot see, that can strike at any moment without warning. Don Coldsmith splits this story into three parts. The first dealing with the horror of smallpox; the second the battle to survive the disease and that of Running Deer and Gray Mouses’ trek to find the survivors; and the third part that sees a jump forward of ten years, bringing new heartache for Gray Mouse as she struggles to find out who she is. This takes her on a dangerous trail of self-discovery that could lead to her death at the hands of a tribe first met in an earlier novel in the series; Bride of the Morning Star. In conclusion this is another excellent entry in this first class series.